It is no secret that I am fascinated by Apple and the technology industry as a whole. I have written amply about Apple and the neighboring technology industry for the past few years (and have read about them for almost nine years now). When news broke that Apple was working on a car, my Twitter timeline was evidence of my not knowing of what to think. Although I don’t follow the automotive industry as closely as tech, I am a fan of cars and car design. I know when the new car models are released, what they look like, and what features have improved over the previous models. What I don’t know, however, is how the automotive industry operates (who are the suppliers, what materials are used, and so on), who the key players are, what the market share of each key player is, competition in the industry, and how profitable the automotive industry is in general. When I began following the technology industry, I didn’t know any of the above questions either, but through time I developed a thorough understanding. It is now time for me to develop an understanding of the automotive industry, which seems ripe for disruption. If you’re reading this, I imagine you are in a similar boat to mine; you follow the tech industry closely, and have a newfound interest in cars after the recent Apple Car rumors. In the next few months, I will starting delving into the auto industry (in addition to the usual tech posts I publish) to gain a better understanding of it. Some questions I want to answer early-on are: what would Apple gain from entering the car market, how much profit is in selling cars, and what are the unexpected consequences of entering a wholly new market (in addition to many other questions). So sit down, buckle up, and enjoy the ride. Scotiabank published a great report on global auto sales, and it is as good of a place to start as any. In 2014, a total of 71M cars (includes light trucks) were estimated to be sold around the world. 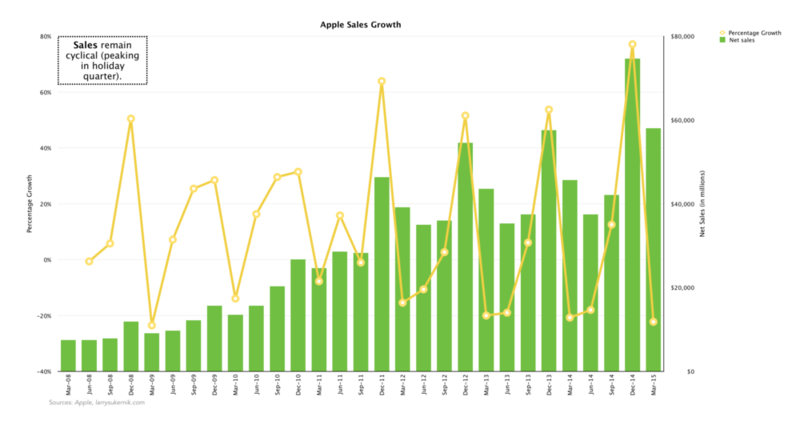 For comparisons sake, Apple sold 74M iPhone’s during the last quarter. Obviously a car is a much more expensive and thoughtful purchase, but hopefully you notice the great disparity in scale between the tech and the automotive industry on a unit basis. Most car sales occurred in Asia (32M), North America (19M), and Western Europe (12M), followed distantly by South America (4M) and Eastern Europe (3.8M). 2015 forecasts have global car sales increasing by 3M to 74M, which implies a 4% growth rate. It appears the automotive industry is not a growth market by any means (feel free to prove me wrong). 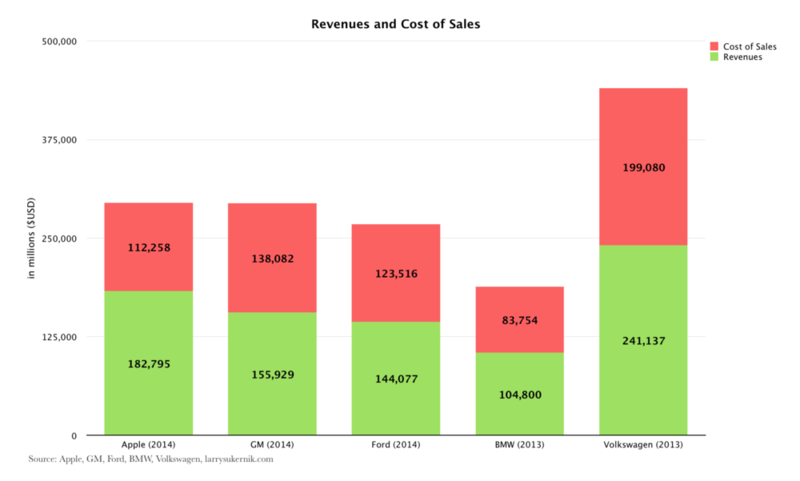 I chose some of the better known car manufacturers for this next chart, just to compare them to Apple. Academically, it is wrong to compare a company in one industry (tech) to another (auto), since two the industries are different in almost every regard. That said, doing so establishes a nice sense of scale which can help us understand the relative sizes of the companies. It may also help to answer why Apple may be interested in making cars in the first place. 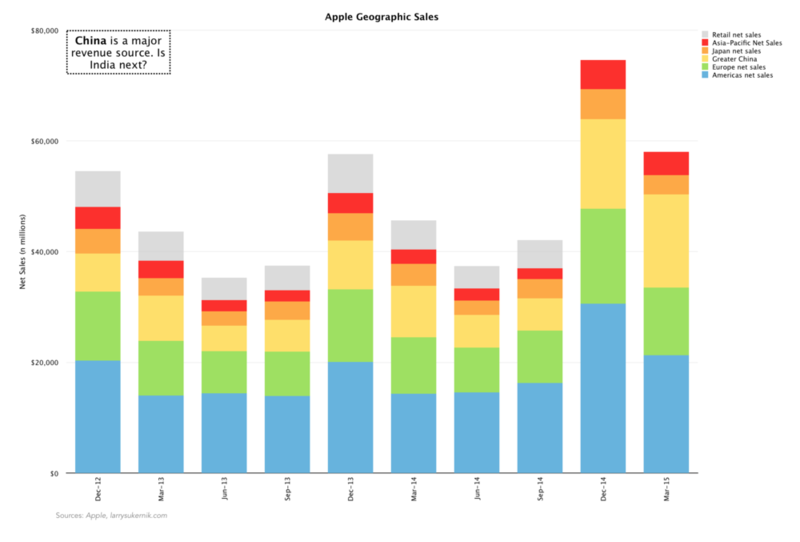 In terms of yearly revenues, Apple is second only to the Volkswagen Group, which is a holding company that owns brands such as Volkswagen, Audi, Bentley, Bugatti, Lamborghini, and Porsche. It is also worth mentioning that the revenues included in the above chart are comprehensive, meaning that they include the revenues not only from vehicle sales but also from the financial arms of the automotive companies. I did this deliberately because if Apple got into the car business, they would presumably get into the leasing business as well. 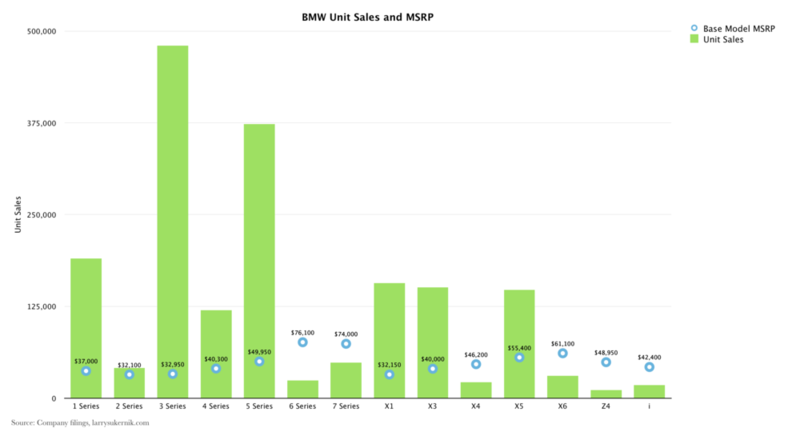 Also note that I used the 2014 figures for Apple, GM, and Ford, and 2013 figures for BMW and Volkswagen. This is because the annual reports for the German car companies weren’t released yet. I doubt the 2013 figures would differ materially from the 2014 ones, though. 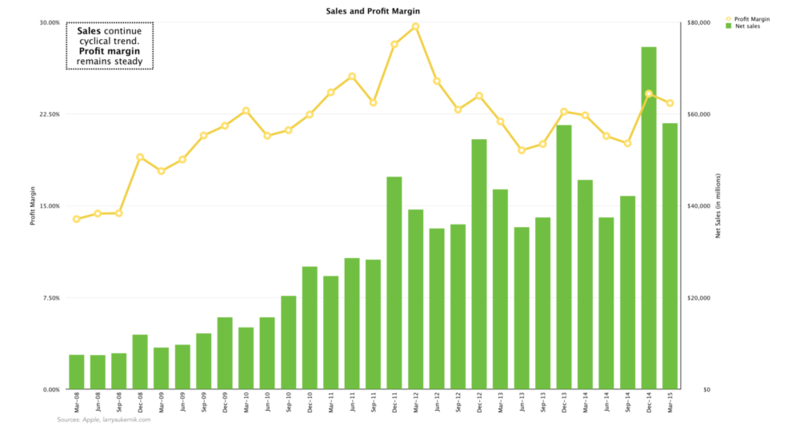 Apple had by far the highest gross profit out of the companies in this comparison. You would assume that automakers make boatloads of profit on each car they sell, but the data says otherwise. The costs in selling a car are not much higher than the costs involved in making one. 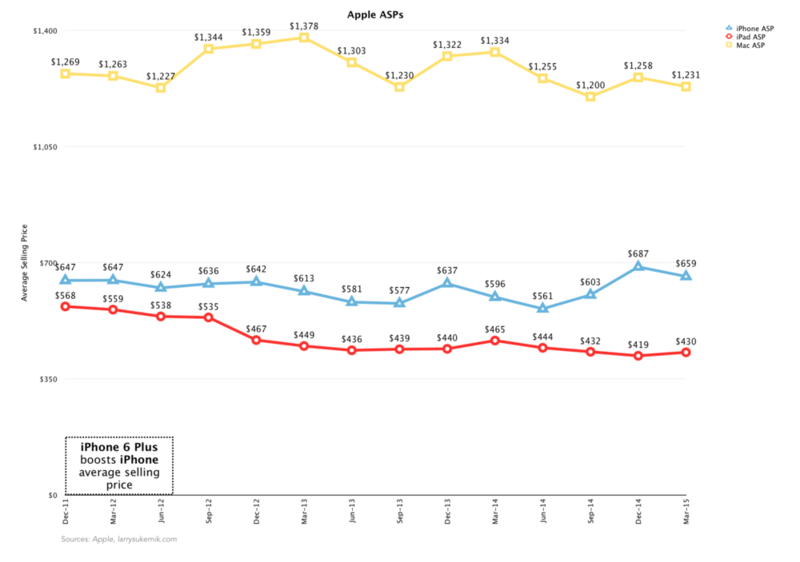 In terms of a gross profit percentage, Apple is the victor once again. 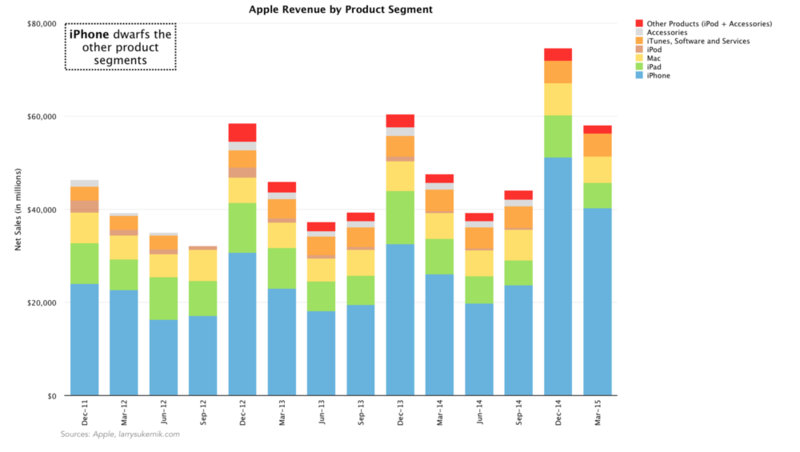 For every $100 in revenues, Apple keeps $39. For every $100 the car companies make, GM keeps $11, Ford $14, BMW $20, and Volkswagen $17 (this is before any operating expenses, taxes, and interest charges). 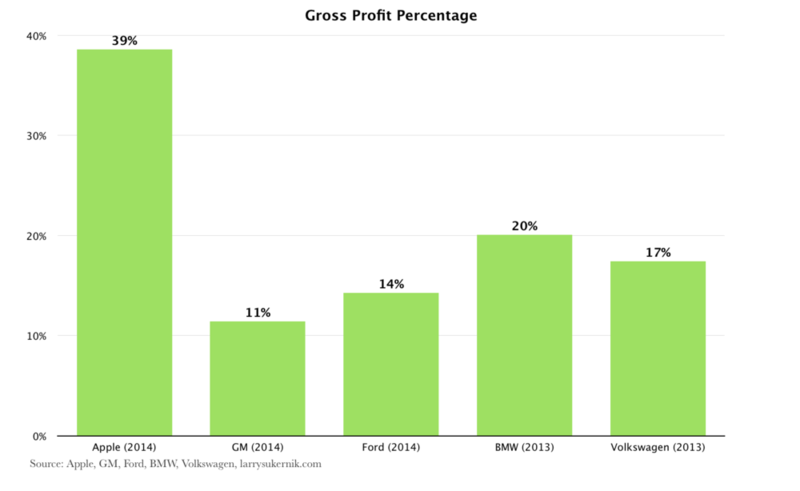 Although I did not include Tesla in this analysis (it deserves its own analysis, which will come later), you might wonder what its gross profit percentage is. 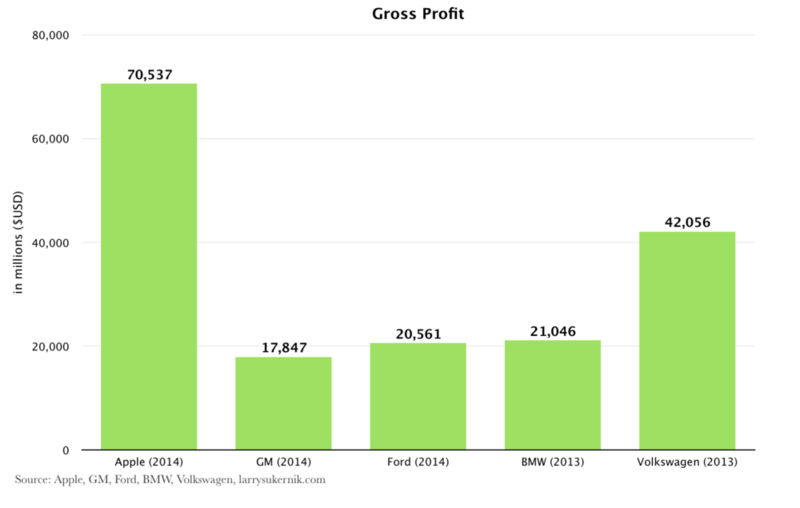 By my calculations, it’s 28%, meaning that Tesla gets to keep $28 per $100 of revenues, which is the highest gross profit percentage out of all the other car companies compared in this analysis. It doesn’t take a genius to see that manufacturing cars is an expensive business. If Apple entered the auto industry, they would either have to get used to lower margins, charge higher prices to offset the cost of sales, or lower manufacturing costs. That is a difficult problem to solve - no wonder Apple is on an automotive hiring spree. The culmination of all the above information leaves us with the net income of each company. 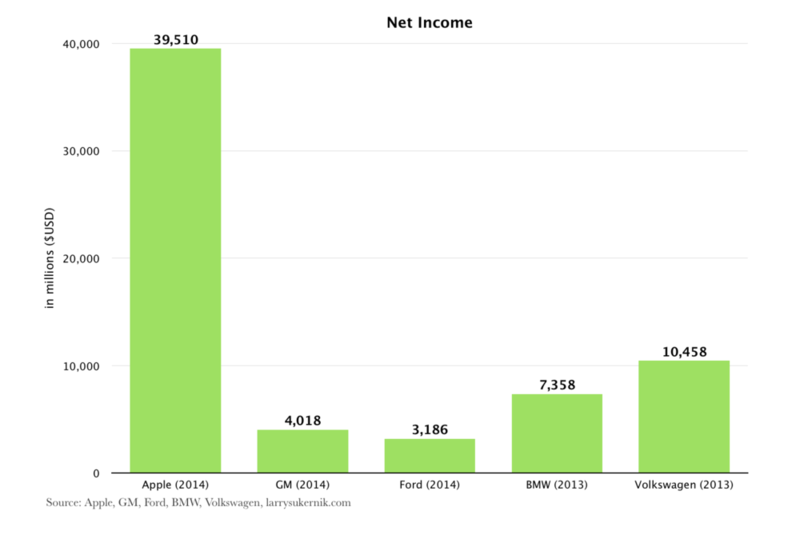 As you would expect based on what we learned previously, Apple had the highest net income out of all of the car companies. Not only is it higher, but Apple’s net income in 2014 is 1.5x higher than the net incomes of GM, Ford, BMW, and Volkswagen combined. Apple’s calendar year ends in September, mind you, and the data from BMW and Volkswagen is for 2013, but the size of Apple’s profits is still mind-boggling. Even if Apple made a successful vehicle, it is highly unlikely the car business would be as large as the iPhone business. 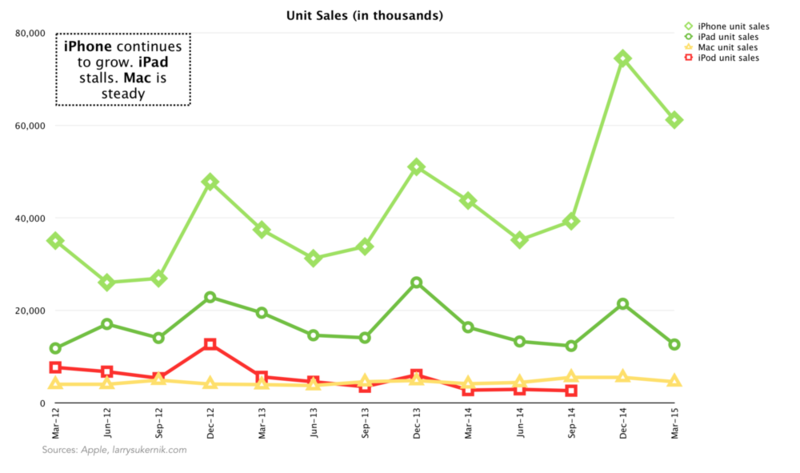 Apple sells more iPhone’s in one quarter than all car companies combined sell cars in a year. Making cars is extremely expensive. The price you pay for a car isn’t far from what it costs a car manufacturer to make one. We will delve into the profit margins of luxury vs. base cars in a later analysis, but as a whole, cars don’t have the best gross margins. 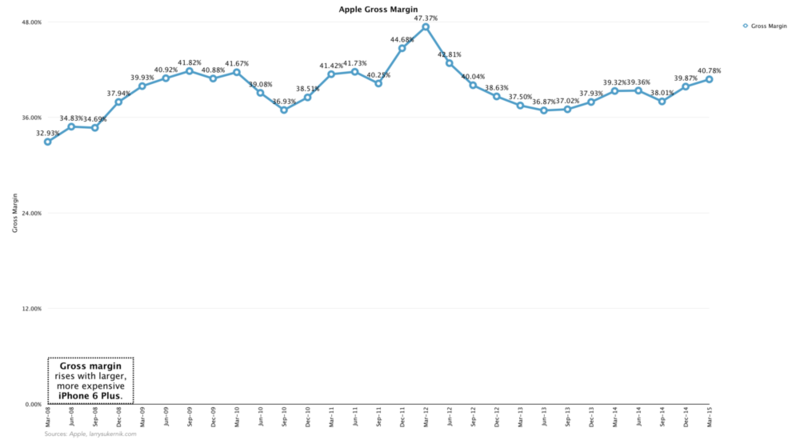 They definitely don’t come near the gross margin percentages Apple is used to. The key element in the manufacture of cars is suppliers. Essentially all car manufacturers purchase parts from hundreds of different suppliers. Apple would presumably have to do the same (they so for their current products).